If you're like me then growing up you've seen most, if not all, of the Who's The Boss? episodes. The show had near an eight year run and stayed in syndication forever. A former major leaguer and widower forced to retire with a bum shoulder takes a job as a live-in house keeper to a divorcee ad agency executive in an effort to give his daughter better surroundings to grow up in a move -as seen in shows opening credits via Tony's Amber Alert beater van- that sees Tony and Samantha going from Brooklyn to a haughty part of Connecticut. A tale as old as time. I remember two things specifically about Who's The Boss? One, Alyssa Milano going from a cute kid to a super hot babe at just the right time for my hormones. Second, I was always pretty amused with how Tony pronounced Angelar all New York-like. 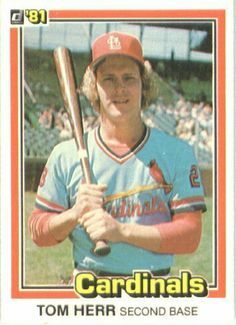 It was established that Tony was a second basemen with the St. Louis Cardinals. 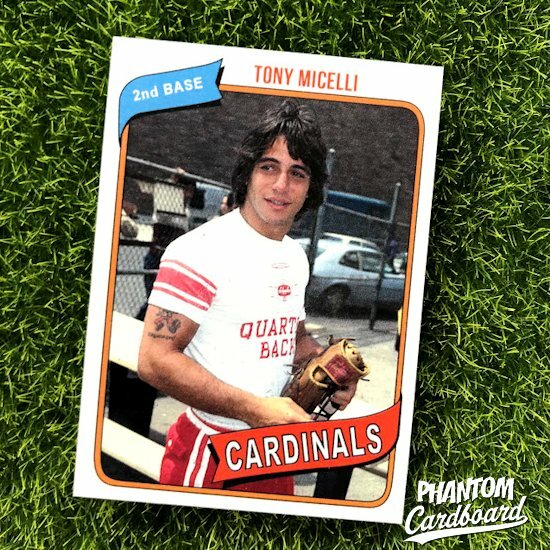 If the show premiered in 1984 I figured a card with the 1980 Topps inspired design gave Tony a chance to wash out of the bigs and run through all of his funds. Any chance I get to use the 1980 template I'm taking. The image I found was the second. The first was pretty poor quality. Not only did I luck up on a cleaner image but Danza's in a red baseball pants and looking young as can be. Total score. I was reminded in the Instagram post I did of this card by @hamfx that there was an episode of Who's The Boss? where Angela is trying to track down a baseball card of Tony's baseball card as a sentimental Christmas gift for him. It's the 11th episode of the 3rd season entitled "The Christmas Card", (1986). I seemed to have remembered that the card was never actually shown on the episode, but @hamfx was thinking it was. I looked on Netflix and Hulu but the series isn't showing on either. @hamfx not only found it on DailyMotion, but he also grabbed a screen capture! From the look of it it looks the card used in the episode may have been loosely inspired by the 1981 Donruss set, judge for yourself. And, if you're on Insta give @hamfx a follow. Labels: 1980 Topps baseball, St. Louis Cardinals, Tony Danza, Tony Micelli, Who's The Boss?